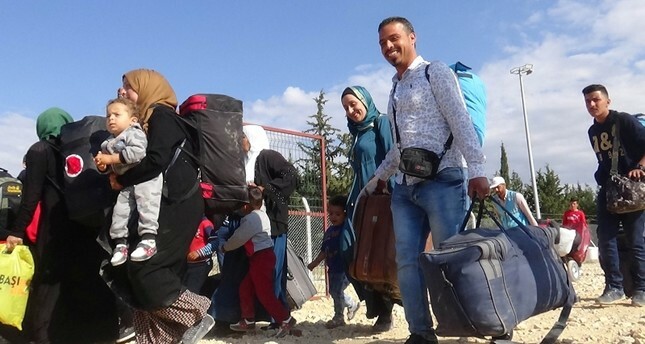 Thousands of Syrian refugees are returning to their home country for the Ramadan holiday after the Turkish army liberated terrorist hotbeds near the border. Nearly 39,000 Syrians have returned to areas, including Azaz, Afrin, Jarabulus, and al-Bab, secured by the Turkish military’s Operation Euphrates Shield and Olive Branch, according to an official at the migration office in Turkey. A total of 76,000 Syrians applied online to Turkish authorities to spend the eid holiday in Syria, according to the official who spoke on condition of anonymity due to restrictions on talking to the media. Muslims across the world celebrate Eid al Fitr, a three-day festival that follows the fasting month of Ramadan. Syrians will return to Turkey from June 26 to July 6. Speaking to Anadolu Agency at the Öncüpınar Border Gate, a Syrian national Saddam Haco said he was returning to Syria for a second time since the civil war. Haco said he was looking forward to seeing his parents again after three years. At the buffer zone in Öncüpınar Border Gate in Turkey’s border province of Kilis, officials from Turkish migration agency as well as gendarme and police teams assisted Syrians. Turkish health officials vaccinated Syrian children aged 0-15 and some aid organizations distributed bottled water. Operation Euphrates Shield, which began in August 2016 and ended in March 2017, was aimed at eliminating the terrorist threat along the Turkish border with the efforts of the Free Syrian Army, backed by Turkish artillery and air cover. On Jan. 20, Turkey launched Operation Olive Branch to remove the PKK-linked People’s Protection Units (YPG) and Daesh terrorists from northwestern Syria’s Afrin region. On March 18, Day 58 of the operation, Turkish troops and Free Syrian Army members liberated the town of Afrin while also neutralizing 4,497 terrorists. They must be si happy even their house has destroyed , but at least they can life freedom in their own place. House can be built again. No problem. May God give them a bit of light, happiness and strength to build yheir own life again. A good lesson from Allah. Be peace and tolerant love each other— fight the extremist Islamic ideology. You will be fine.